A renowned photographer, tutor, author and Ilford Master Printer, Andrew Sanderson offers practical tips on working with film and traditional darkroom techniques. The gate in this photograph is at the bottom of my garden, separating us from our neighbour. When we first moved to this house ten years ago, I took quite a few shots of the place and the surrounding areas, with many of the images photographed in the early morning because I was so taken with the light. Our previous house had been in a small, dark valley and didn’t get sunlight till nearly noon, so to experience light in the morning was something of a novelty. On the particular early morning when I took this image, there was dew on the cobwebs and there was a light mist in the air. It was the cobwebs that really appealed to me, and in order to capture them in enough detail I knew I would need to have a really sharp lens on the camera. Also, to give them the proper impact, I knew I would have to throw the distracting items in the background out of focus, and so shoot at maximum aperture. Therefore, the camera I settled upon was a Mamiya C330f with an 80mm f/2.8 lens. This lens gives excellent results and falls off in focus quickly and in a very pleasing way, so it was an ideal choice. The other benefit of using the Mamiya C330f is that it is a square-format camera. I love the impact a square crop can give, and it was so suited to this composition. I really cannot imagine it as a rectangular crop. That said, I was not really thinking consciously about the composition when I took the image. My method of composition in this instance was largely unconscious – I could feel when it was right as I looked through the viewfinder. I find that I do this quite a lot, and it’s really hard to explain. Whenever I look around for possible images, I am mentally drawing a box around things and working out which bits need to be included and which bits are distracting or superfluous. I do this before I’ve even picked up the camera, so by the time I look through the viewfinder I’m just refining what I’ve already seen. I also see the finished print in my head before I press the shutter and I know exactly what I’m going to do with it. The Mamiya C330f is a film camera, which is really lovely to use and has produced some great shots for me. For this particular picture I used Ilford HP5 film, as I have for 99% of my images. The optics are so crisp on these cameras that it needs a fine-grained, sharp film to get the best out of them. Whenever I’ve used HP5 processed in Perceptol, it has given outstanding prints. On this occasion, I processed the film in Ilford ID-11 and used my personal method of developing film, which is to downrate it 1 stop and reduce development accordingly, which gives a beautiful tonality. The print didn’t need much in the way of manipulation in the darkroom, so I simply burned it in slightly in the top left in order to hold the viewer’s eye in the composition. In order to get a real sense of how crisp and sharp film images can be, you have to be in front of the print, looking closely at the tonality and detail of the printed product. If you have never held a large fibre-based print made from a great negative in your hand, or seen one up close in an exhibition, you have missed out on one of life’s great pleasures. When I help students and workshop attendees to produce high-quality prints from their own negatives, they get so excited! Medium-format film in a decent camera can produce amazing results up to a print size of 20x16in and large format is even better. I work with 5×4, 7×5 and 10×8 cameras, and although they are not the right choice when you want to respond to something spontaneously, they are worth the extra effort. As far as this image goes, I didn’t rank it highly among my other work. I thought it had turned out OK, but so many people have commented favourably about it that I’ve reassessed my views. I’m always surprised and puzzled at how differently people view photographs: as a printer, I’m looking differently at a picture than, say, a member of the general public might. Viewers of this image often bring their own experiences to their interpretation, seeing things that resonate with their childhood or personal phobias. 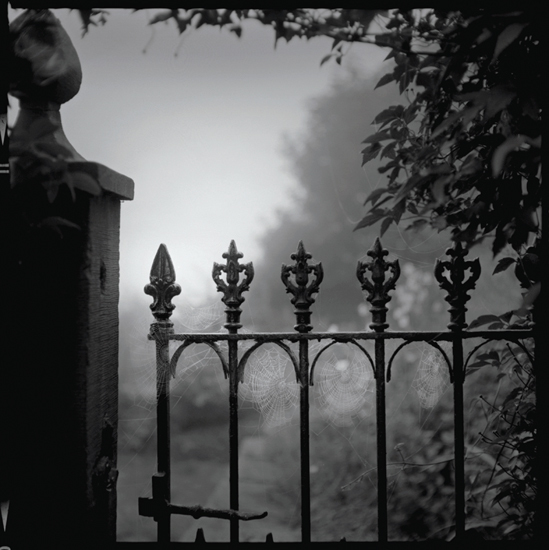 Some have said they see a garden gate as an expression of incarceration, whereas others have viewed it as romantic. used to be a right of way, but nobody uses it now, and since this was taken it has become quite overgrown so sadly there’s no chance of a re-shoot now. student’s own darkrooms. He has a blog devoted to analogue photography www.thewebdarkroom.com. Contact andrewsandersonphoto@googlemail.com for workshop details.